It has all started in 2007..
Back then 200 participants of Infoshare took part in programming workshops at Gdańsk University of Technology. Today Infoshare is the biggest Tech Conference in Central and Eastern Europe. 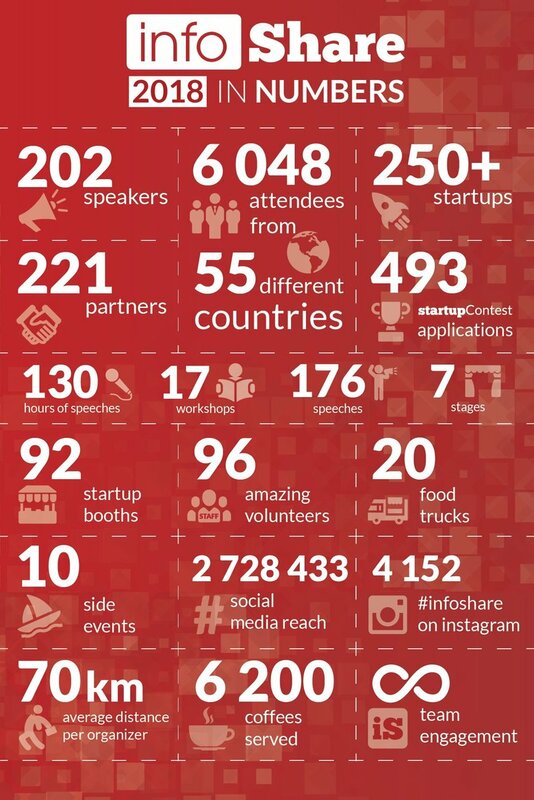 The 12th edition of the event that took place in 2018 gathered over 6000 participants, almost 200 start-ups and over 200 speakers and investors. Our mission is to create a space where you’re able to share experience, gain knowledge and meet people with similar interests and passion. We invite keynote speakers, organise workshops for professionalists and arrange meetings between startuppers and investors in Speed Dating format. Over 80% of participants from previous years declare that during the conference they’ve met potential investor or at least started the conversations. Infoshare is also a great boost of knowledge. In 2018 we focused on 7 thematic stages where performed i.a. Brian Fanzo, Chris Kubby, Michał Szafrański, Jeremy Goldman, Eric Siu, Pocket Sun, Zbigniew Wojna, Filip Wolski, Piotr Konieczny, Zoe Rose, Janina Bąk, Scott Helme and Thomas Thurston. Our conference is supported by many worldwide known brands like Google, Microsoft, Intel, Samsung, HP, Bayer, IBM, Amazon or Lufthansa Systems. Interested in more details from this years’ event? Visit our blog.